A swarm of zombies has swept over feudal Japan brought forth by the maniacal ravings of a mad monk opposed to the Emperor and his daimyo. The dead walk at night, searching to feed upon the brains of the living and turn others into their mindless brethren. Soon, they will have an army of virtually unstoppable opponents and the fragile peace brought forth by the band of daimyo will be shattered forever as the nation plunges into chaos. Only one group of elite warriors stands ready to save Japan from certain destruction: the Zombie-ryu. Comprised of samurai and ninja who have banded together forming a rag-tag band of ronin, they scour the countryside for zombies and dispatch them with courageous and outlandish battles. Each of the nine warriors is lethally adept with a different weapon. Shigoko (“secret talk”) is an eighteen year old young woman who longs for a life of adventure, but was born into the family of a farmer. She lives alone with her father and their most prized possession is an old samurai sword. 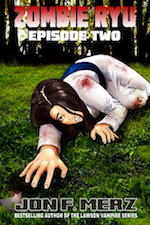 Late one night, her family’s farm is attacked by zombies and she only just manages to escape, fleeing alone into the dark night. When she stumbles into the camp of the gnarled ronin Fudo and his squire Nishi, her world suddenly changes and her destiny begins to reveal itself. 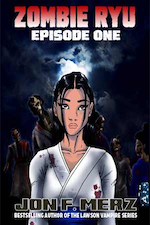 The journey of the Zombie Ryu will take them to the furthest reaches of Japan, the most remote peaks and valleys, and the most brutal settlements where lives are measured in mere breaths. At each location, Fudo will have to convince the warriors they seek to join them. And all the while, Shigoko will have to learn a very different life than the one she left behind. Only time will tell if they are successful and only time will tell if Shigoko has what it takes to truly become the warrior she has always dreamed of being.